PRODUCER: Roan, it’s not evening. ROAN: (Turning to the producer) What? PRODUCER: It’s noon. It’s not evening. ROAN: And who mentioned an evening? PRODUCER: You did. Just then. ROAN: Well, I was saying it for the benefit of everybody who lives in Shenkuu. PRODUCER: (Brief pause) Shenkuu is in the same time zone as us. ROAN: What about those Shenkuu people who live in Meridell? PRODUCER: In that case, it may be evening. But for everybody watching, it’s noon. ROAN: If you insist. (Returning to face the contestants) So, we have five contestants today. I have been informed that I need to refer to you by your real names, which is quite disappointing, but I’ll try to live with it. Anyway, introduce yourselves. EYRIE: Hello, my name is Poddragos, and I live in Meridell. KORBAT: Good afternoon, my name is Willine, and I come from the Lost Desert. XWEETOK: My name is Jocaster, and I live on Mystery Island. YURBLE: My name is Hakka, and I live in the Haunted Woods. RUKI: My name is Elgra, and I live in Shenkuu. ROAN: (Sarcastically) Fascinating. (Normally) Now, this competition has been changed slightly, as some people (glaring at the producer for a second) believe that the points system is a little bit biased. Therefore, I will ask you each a question on a certain topic. You will then have to vote on who you believe is the worst player. Whoever is voted the worst will be forced to leave. Now, we have a special wheel, to help determine which subject will be used first. (Shouting) Producer! The wheel! ROAN: The Wheel of Subject Choosing. PRODUCER: We couldn’t get one. ROAN: What have we got, then? PRODUCER: Er... well... we managed to hire... one. PRODUCER: The Wheel of Monotony. ROAN: Oh. Well, bring it out. ROAN: I’ll spin the wheel. ROAN: And where the wheel stops, that is the subject you will be quizzed on. ROAN: Well, whilst that’s happening, let’s get to know some of the contestants. So, Elgra, how come you’re red? ELGRA: Well, I suppose it’s just because I am. ROAN: Interesting. And Hakka, what do you do when you’re not in Altador. HAKKA: I work part-time for Sidney selling scratch cards. ROAN: And the topic is... Entertainment! Let the questions begin! We start with the person who is first alphabetically. That’s you, Willine. ROAN: Don’t argue. Willine, in Turmac Roll, the base value of an Aquaberry is how many points? ROAN: You’ll never get there. We’re looking for two hundred. Jocaster, Snowmuncher launched to fame which Polarchuck? JOCASTER: That would be Dieter. ROAN: I’m sorry, we were looking for ‘two hundred’. ROAN: You lose ten points! JOCASTER: But we don’t score points. ROAN: Just because you’re losing. Hakka, in Neoquest II, what is the name of the main character? ROAN: No, it’s Dieter! Silly blue Yurble. Fancy thinking that Rohane was in Neoquest II! PRODUCER: Roan, there’s been a slight printing error on the cards. ROAN: The answers seem right to me. Elgra, the name of the game where two Petpets battle each other in an arena is called what vs Feepit? ROAN: Is correct. I do love a good game of Rohane vs Feepit. Poddragos, the game where users are able to use a mallet on the team of people who make Neopets is called Whack-a-...what? ROAN: (Whispering) Not so loud! They’ll hear you! They don’t like that game. (Normal voice) Yes, that is correct. And that is the end of the round. I’ll start the wheel now, so that it’s chosen a subject by the time we need it. (He spins the wheel.) Right, please state the name of the pet that you wish to leave this show. ROAN: (Short pause) You’re not allowed to do that! You’ve all got to vote for different people. Do it again! And you can’t vote for the same person again. ROAN: (Longer pause) Are you doing this deliberately? Are you trying to test my patience? ROAN: Answer me! You, Jocaster. Why? ROAN: Don’t interrupt me. Right, we’re doing it again. ROAN: (Interrupting) No, stop. We’ve got a unanimous decision. Sorry, Elgra, your game is up. ROAN: And, as a result of a generous donation from our sponsor, Dr I. N. Sane of the Neopian Laboratory, we have a special method of removing our unwanted guests. ACTIVATE THE LAB RAY! PRODUCER: (Hastily) Don’t worry, it’s just... sent her home, that’s all. ROAN: (Turning) Really? I thought it turned them into soot? (Producer makes silencing gestures.) Wasn’t that what you said? You said that you didn’t really have any control over it (gestures grow more frantic), and that they’d be lucky to arrive home in one piece. (Producer throws rock at Roan.) Ow. What was that for? (Glares at Producer, before turning back to the contestants) We move on to Round Two. ROAN: (Stares at the wheel for a while before giving up) Tell you what, I’ll choose the next round. Let’s go for... History. ROAN: And that sound, kindly provided by our sponsors from Loud And Pointless Noises Inc., means that the subject is swapped for its direct opposite. Therefore, you will now be quizzed on events in the future. Poddragos, what major event will happen six years from now? PODDRAGOS: Er... Neoschools will be released? ROAN: (Scoffing) No! That’s not going to happen as soon as that. No, the answer we were looking for was ‘Neopia will be invaded by mutant Meepits.’ (Takes another look at the card). Really? (Frowns at it for a second, then shrugs). Oh well. Willine, in Geography, in what year did Dr Sloth finally take his revenge on Neopia? WILLINE: (Long period of silence) Pass. ROAN: Correct. We don’t know either. Jocaster, in Meridellian Royalty, when will King Skarl announce his abdication from the throne? ROAN: Oh, OK. That’s not what I’ve got written down, but I’ll believe you. Hakka, this is an audio question. In which month will this happen? ROAN: (Turning to Producer, and talking in a stage whisper) Have we not got the live band? PRODUCER: (Whispering equally loudly) No. Live Bands Ltd pulled out, because they thought the show wasn’t worth it. ROAN: At least they had a valid reason. So, we can’t do the audio questions? ROAN: (Returning to the contestants, smiling) So, Hakka, produced an answer yet? HAKKA: (Confused) But I haven’t heard my audio yet. ROAN: (Appearing puzzled) Haven’t you? I heard it. Did you, Producer? HAKKA: (More confused) Can you play it again? ROAN: (Slightly flustered) Er... well... we, er... um... yes, of course. (Short pause) Did you get it that time? HAKKA: (Extremely confused) But you didn’t play anything! ROAN: I think somebody’s playing for time. Just answer the question! HAKKA: Er... the Month of Gathering? ROAN: We were looking for the Month of Eating, so close enough. ROAN: And I have no idea what that one means, but it sounds important, so it’s probably the end of the round. Vote, please, for the contestant you don’t want to not miss the chance not to fail to get to the final. ROAN: Place your votes now! PODDRAGOS: (Uncertainly) Hakka... I think. PODDRAGOS: (Interrupting, panicked) But Hakka got the same number of votes! ROAN: (Pausing for a moment, and counting on his fingers) Oh yes! Thank you. You get a point for that. In this situation, then, we do a tie break. PRODUCER! FETCH THE TIE! ROAN: (Cutting the tie in half) Right. That’ll decide it. ROAN: (Staring thoughtfully at the two pieces of tie) I’m not entirely sure. (Dropping the pieces) Oh, let’s just let the lab ray decide again. ROAN: (Nonplussed) ...Erm... OK... right... anyway. (Regrouping) Very well. Jocaster, you have been eliminated from this round. Producer, go and tell Kiss the Mortog that we’ve got a new contestant for them. Make sure they pay for it this time – they’ve had the first two free, after all. ROAN: We move on to Round Three. Let’s check the wheel! (The wheel continues to spin.) Let’s not check the wheel! Round Three will be a pot luck round! ROAN: Don’t worry, it’s not that interesting. Basically, I’m going to show all of the contestants a pot, and they’ve got to tell me how lucky they think it is. ROAN: So, Poddragos, how lucky do you think this pot is? WILLINE: (Examining the pot carefully) I would say it would probably not be very lucky at all. ROAN: (Attempting to raise a suave eyebrow, but failing, raising two instead and merely looking startled) Controversial, certainly. And Hakka? HAKKA: (Confidently) I think it’s very lucky. ROAN: And, by ‘very’ lucky, do you mean more than ‘quite’ lucky? ROAN: Congratulations. You have won this round! (Hakka looks pleased.) And, as your reward, you win the pot (Roan passes the pot to Hakka), and the honour of testing the luck of the pot against our ray! ROAN: Turns out to be not so lucky after all! (He laughs nervously, seeing the petrified looks on the faces of the remaining two contestants.) Don’t worry! 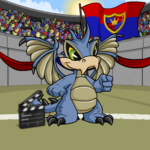 He’ll probably turn up in Neoquest sooner or later. Somebody will find him. Hopefully. ROAN: (Turning to face the Producer) That doesn’t sound very healthy. Is it supposed to be doing that? (Producer shrugs.) Well, go and find Dr Sane, and ask him! ROAN: (Nervously) Hurry up! Come on, choose a subject. Don’t worry, it’ll be fine. PRODUCER: Roan, Dr Sane has no idea why it’s making the noises. ROAN: (Whimpering slightly) Oh great, he doesn’t know. He has no idea why the big lab ray thing doesn’t work. We’re all going to be zapped. I’m going to stop being a Scorchio. I’ll be turned into a Korbat with no wings, or... or a Flotsam with no tail. And I’ll probably have no hit points. And purple. And female! (He shudders) I can’t do this anymore. I quit! PRODUCER: (In a side whisper to Dr Sane) Can you turn the ray off? DR SANE: No. It’s self sufficient now. ROAN: It can’t be turned off! Oh no! PRODUCER: I think now might be a good time to end this show. PRODUCER: (Whispering) Faster, it’s about to fire. UNSAID ECHO OF PRODUCER: It’s noon, Unsaid Echo. UNSAID ECHO: Does it really matter? Nobody can hear this, anyway. Mummified omelette. A recipe from the Lost Desert brought to the far land of Tyrannia a long time ago. Unforgettable one million year taste, you'll see. Wow! How did you know?